Not just the Dallas Cowboys are moving to Frisco. Thousands of apartment renters are making their way to the Dallas suburb, too. Frisco was ranked as the second busiest apartment market in the country, according to a new report by industry analyst MPF Research. In the last four years, Frisco’s apartment base has almost doubled, the Richardson-based research firm found. Renting in Frisco isn’t cheap. The average monthly apartment rent in Frisco is $1,115, MPF reports. That’s about $100 a month more than the Dallas-Fort Worth average. But creation of thousands of high-paying jobs in Frisco and West Plano is bringing people to the area. “Tons of companies are flocking to the Frisco/Prosper submarket (or very close to it), and naturally, employees are following,” MPF analysts say in the new report. “Despite high levels of multifamily development, the submarket has continued to report strong occupancy figures and steady rent growth. While Frisco was at the top of MPF’s booming apartment market list — second in the nation only to Charlotte’s Uptown district — several other North Texas rental markets also ranked high. Dallas’ center city “Intown” market was 14th on the MPF busiest markets list, with 6,971 units under construction. And the North Fort Worth area ranked 16th nationally with 1,010 units in the building pipeline. The Rockwall, Rowlett and Wylie market was 18th with 1,328 more units on the way. And Dallas’ Oak Lawn and Park Cities markets was 20th nationally, with 3,061 apartments under construction. The busiest markets ranking was based on current and completed apartments since 2012. North Texas is second in the country in overall apartment construction, and more than 50,000 units are on the way. 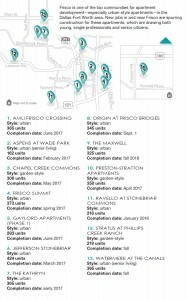 When it comes to new apartment development in the Dallas-Fort Worth area, Frisco is one of the hot spots, according to information from Axiometrics, a Dallas-based research company with a focus on apartment real estate. As of July 18, the Uptown Dallas market had the most apartment development in the area, with 3,073 new units to open this year, followed by the Collin County and Richardson markets. 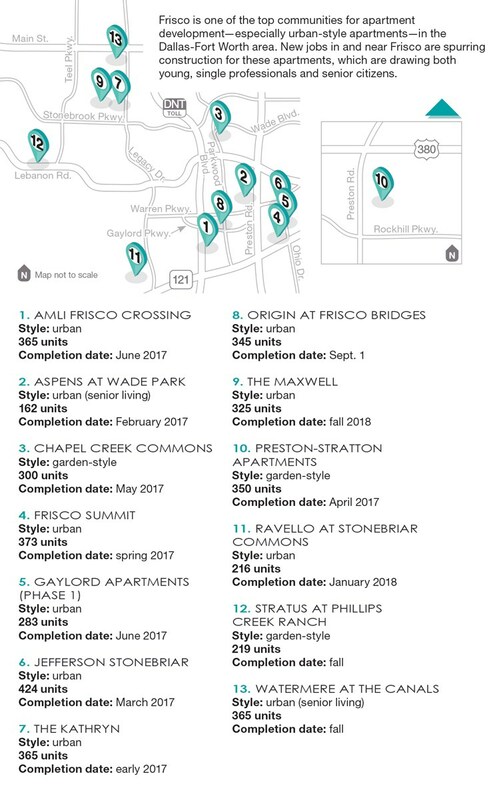 Frisco has 1,727 new units that are either up for lease or will be up for lease later this year as well as an additional 1,580 units under construction, bringing the total to 3,307 new units that will be open within the next few years. AMLI Frisco Crossing near the Dallas North Tollway and Gaylord Parkway is contributing 325 units to that total. The complex’s community manager Ashley Dodds said she is not worried about filling up those units. Frisco’s apartment occupancy rate is 95.7 percent. This multifamily development growth is being spurred by job growth in the area, said John Lettelleir, Frisco director of development services. Many new apartments in Frisco are concentrated in or near the $5 Billion Mile and other mixed-use developments where new jobs will be located, he said. Most apartments coming into Frisco are urban-living units, which are on average denser than traditional garden-style apartments and are typically placed on a street grid with the building adjacent to the sidewalk. Urban-living apartments also have parking garages, whereas garden-style apartments have surface parking. These types of apartments can typically be found in mixed-use developments, such as Frisco Square. 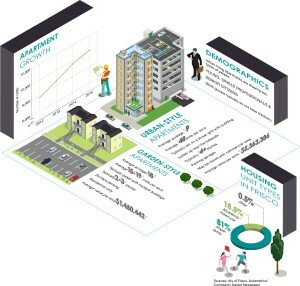 The demographics driving the urban-living development are young, single professionals and senior citizens. The similarity between both groups is that neither have children, said Tim Nelson, Realtor and Frisco City Council member. Single professionals are moving to Frisco for the jobs available, whereas senior citizens are downgrading from a single-family home to an apartment often to be closer to family, Nelson said. Apartment developer JPI, which is building the 424-unit Jefferson Stonebriar project at Warren Parkway and Ohio Drive, decided to build in Frisco because of the job growth in the area. “The $5 Billion Mile and Legacy Business Park developments have solidified Frisco as one of the highest job density areas in Dallas-Fort Worth, especially with the corporate relocations of Toyota, FedEx and Liberty Mutual, among others, which alone are forecast to bring over 9,000 new jobs to the area,” said Matt Brendel, JPI’s senior vice president and development partner. Many new mixed-use developments and office parks, such as the developments within the $5 Billion Mile, are including multifamily living in their plans, Lettelleir said. Existing office developments, such as Hall Park, are also looking to add multifamily living. The average rent in urban-living apartments is typically one of the most expensive because it costs more to produce one of these complexes, Lettelleir said. The current average rent for established apartments in Frisco is $1,249 per month, according to Axiometrics. For the new apartments up for lease this year, the average rent will be $1,446 per month. Frisco City Council member Will Sowell said he has had concerns in the past with the density that apartments can create in the city, adding that he sees single-family home development as more of a priority. However, he said urban-living apartments do make sense within certain developments, such as along the $5 Billion Mile. Urban-living apartments have one of the highest assessed values when it comes to property taxes, Lettelleir said. Assessed values of urban-living complexes are on average about $5.4 million per acre while garden-style apartments are assessed at about $1.5 million per acre. The property values generate extra money for the city, Lettelleir said. Urban-living apartments could also have a positive effect on the business community, said Tony Felker, Frisco Chamber of Commerce president. Multistory urban-living complexes can be built to have the first floor dedicated to commercial space, which can draw restaurants, retailers and office space. These apartments can also house the workforce for companies moving to the area or already established in the area, providing employees easy access to work, Felker said. Urban-living apartments can pose both a problem and solution for transportation. The higher density of the complexes could lead to more road congestion as more people move in. Lettelleir said to manage congestion, the city needs to look into traffic management solutions. One thing that helps is to make sure these developments are concentrated along major highways, such as the Dallas North Tollway, so minor thoroughfares are not overwhelmed with traffic, he said. On the other hand, urban-living developments could ease congestion by allowing residents the option to not use a car as often, Nelson said. Having a multifamily complex where residents can walk to work or retail and dining options may reduce the need for a car or lead people to share vehicles, he said. Though the residential aspect of Frisco has been known for its single-family housing, not everyone wants to live in a house, which is why the city is focusing on providing more diverse housing options, Nelson said. I ventured in a recent post that Circo, part of the Maccioni restaurant empire, might open a location in Dallas. It’s been confirmed: Circo Dallas is slated to open in February 2017 in the towering building now under construction at 2619 McKinney. Circo New York originated as the whimsical, more casual little sister to Le Cirque, whose first iconic location, opened over 40 years ago by restaurateur Sirio Maccioni, was famous for being frequented by the likes of Jackie Kennedy and Princess Grace, for doing elegance with a kind of saltimbanco panache, for being the first US restaurant to put crème brulee and pasta primavera on its menu. (For an example of how this plays out, crystal and linen under a lush harlequin-bold fabric canopy, check out the interior of the Le Cirque at the Bellaggio in Las Vegas.) Le Cirque now has locations in New Delhi, Mumbai, and Bangalore. Circo, meanwhile, opened first in New York, where its spirit is captured by a flying trapeze. It’s made its way to Abu Dhabi and the Dominican Republic, each time the interior décor retaining central motifs but reflecting the location. Now Dallas. Dallas is an interesting fit, I thought, when I first heard that the Maccionis had their eye on us. We like to be entertained. We like fine dining. We often treat fine dining, in fact, as entertainment. I had no idea what was coming. The restaurant will be housed in the first and second story of the towering building still under construction on McKinney. Le Cirque was looking to expand their brand, says Lauren Santagati, Director of Operations for TenTen Group. This space in the heart of Uptown? A match made in heaven. The restaurant itself will have familiar Circo accouterments: the Maccioni family cookbook, their bottled estate-grown olive oil, the maître d’ who welcomes you at the door. It’s the rest that’s staggering. One touching detail: the Maccionis have received correspondence from near and far over the years. For Circo Dallas they plan to donate letters from Jackie Kennedy, which will hang, framed, a nod to the Kennedy history here. They’re just finishing up the major construction. They should have keys in hand this month. Then Miami-based designer Francois Frossard can do his work. I still don’t know what to think. Are you ready, Dallas? The City of Carrollton is often known for its Historic Downtown, miles of trails, family friendly environment, and its accessible location. But, what many don’t know is that the City has another side, one which includes a thriving corporate community, consisting of divisions and branches of some of the world’s most well-known corporations. Carrollton’s diverse business community is well represented on the 2016 Fortune 500 List released this summer, with 22 Carrollton companies being represented by 18 of the Fortune’s 500. These companies have chosen Carrollton from which to operate; a choice that is benefitted by our location, transportation system, favorable tax structure, access to qualified workforce, and competitive real estate market. 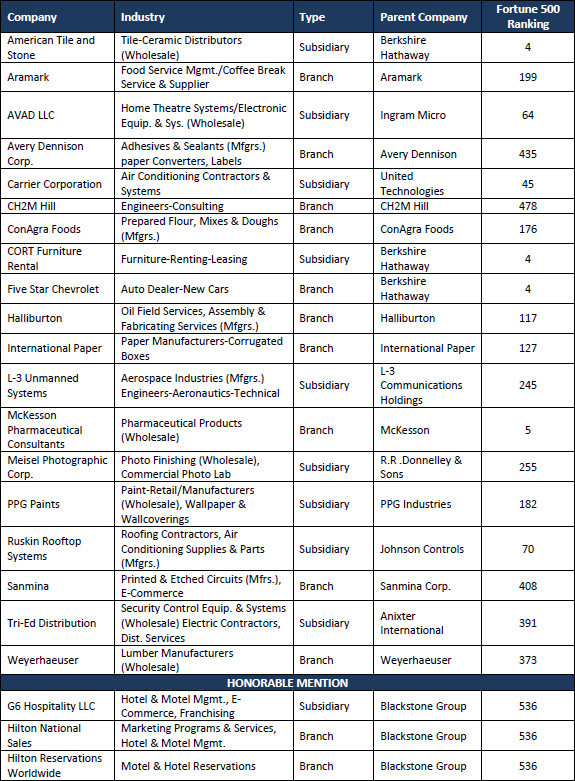 Further contributing to our tax base and overall economy, these companies conduct business between one another and with other Carrollton companies. Of the City’s reported annual $1.3 billion in taxable sales for 2015, it is estimated that over 80% is generated by the services/wholesale sector vs. the traditional retail/restaurant/ entertainment sector. So, it is on many levels that these companies have a noticeable impact on our community. While many Fortune 500 retailers are represented in Carrollton (Wal-Mart, CVS, Kroger, Bank of America), the list below provides a “behind the scenes” look at the side of these global corporations that develops, distributes, stores, markets and manufacturers their respective products within their corporate structures. To highlight a few of Carrollton’s Fortune 500 connections, PPG Paints produces and distributes latex paints for the home improvement and retail paint industries from its Carrollton location. The Carrollton PPG Plant began operating in 1960 and manufactures worldwide recognized brands such as Glidden. PPG Carrollton is a subsidiary of PPG Paints Corporate, which operates in over 70 countries with 2015 net sales of $15.3 billion. Additionally, Sanmina is a global electronics manufacturing services provider and one of the world’s largest independent manufacturers of printed circuit boards and backplanes. Sanmina Carrollton is considered one of Sanmina’s Optical Centers of Excellence, providing design, testing and assembly of state of the art optical modules and subsystems. Sanmina has held it’s ranking on the Fortune 500 list for 15 years. A subsidiary of the Blackstone Group, G6 Hospitality LLC is headquartered here in Carrollton. G6 owns, operates, and franchises over 1,300 economy lodging locations under the household brands of Motel 6 and Studio 6 Extended Stay. Just last year, G6 was rated one of the top 10 hospitality companies according to Hotel Management’s Top Hospitality Company rankings. The City congratulates all these companies for their success and is pleased to provide an environment in which they may continue to thrive. You may visit http://beta.fortune.com/fortune500 to view the full list of Fortune 500 companies. For questions or comments regarding this article, please contact Andrea Roy, Economic Development Manager, Andrea.roy@cityofcarrollton.com.